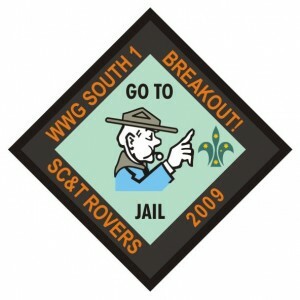 So began â€œBreakout!â€ the inaugural Weekend Wide Game South. TheÂ 13-14thÂ June 2009Â saw the Rovers of the SC&T once again take the WWG event â€œon the roadâ€, joining forces with the Leaders of the (far)Â SouthÂ CoastÂ to see if an audience could be foundâ€¦ and it was! Some 90 Scouts, plus another 70 Venturers, Rovers, and Leaders made their way to Potato Point to see what was on offer. The Scouts were the fugitives, their goal to cross the border to a neighbouring land and freedom. Unfortunately, the border would be sealed for the next 24 hours, and after that would only allow travel for those bearing proper identification. Thus their first goal was to obtain forged passports – yet these would be useless if they were unable to survive pursuit by the guards and the bitter winter night. To this end they were required to evade capture, and attempt to construct their own shelters from material purchased from the local town or obtained from the countryside. Money and goods could be found (or earned) through visits to the various locations found in the area: the local town, the Prison and the UN outpost. A hidden resistance camp was there to be found, as well as several supply dumps set up to aid the escapees. Of particular interest were the â€œruinsâ€ on the beach, where precise grid references could lead a Patrol to dig for a clue to hidden and valuable artefacts. The Guards were (of course) willingly played by the Venturers. These minions of the new government had their own goals: seeking promotion through means both fair and foul, and obtaining wealth from those in power. Rovers and Leaders comprised all three of the authoritarian government, the oppressed natives, and the fanatical rebels. Regardless of role, those in these positions quickly (and quite cheerfully) found ways to make the lives of the Prisoners and Guards difficult. Whilst drawing on the experience earned through past WWG events, this game also introduced a new element: a â€œsub gameâ€ allowing the Venturers to compete against one another whilst performing their own roles. The primary point of this competition being the rank obtained in the military hierarchy. Venturers could earn their way to Commissioner through good performance â€“ or bribery. Bad performance would see them demoted to â€œCannon Fodderâ€ in short order. As there were a limited number of higher ranked positions available, promotions resulted in a demotion for the previous holder of the title. This all lead to some rather intense competition between the squads of Venturers. Of course, competing in the WWG would be nothing without a â€œBunny Runâ€ â€“ the all or nothing dash from one end of the course to the other! With the Venturers now competing, we felt it only fair to give them their own version: the â€œAnti-Bunny Runâ€. Unable to defend themselves, they were required to transport a bulky cart (containing payroll money) to the prison whilst avoiding the attention of the Scouts. The Venturers approached this task tentatively at first, but then warmed to the idea and started developing tactics to get them past the all too eager Scouts. As always, much was learned by observing the Scouts in their natural habitat. Judging by the wheeling and dealing that occurred, there are a fair collection of entrepreneurs and/or conmen (or women) in the current generation of Scouts! Information and goods were thrown around with promises of payment or service. More than one Patrol was even observed attempting to cut a deal with squads of Venturers â€“ and more surprisingly, at one least one of the squads even honoured the deal! As evening fell, Patrols began searching for ideal campsites in which to erect their shelters. Varying degrees of effort went into these structures: everything from a tent fly draped over a shrub, to several highly-organised (and creative) attempts – the shelter constructed of cling-wrap being the most notable of the latter, although the patrols that used their ponchos for their shelter came a close second. Despite all this effort and planning, it was as night fell that the true enemy was revealed â€“ grass ticks! The first aider (and chief tick extractor) reported over 40 removals on one individual alone. As the number of cases increased to a ridiculous level, the organisers waved the white flag and the Scouts were allowed to erect their own tents for added protection. It must be said however, that several Patrols insisted on braving the threat and stayed in their own shelters. The next day saw the urgency increase dramatically as Patrol scrambled to assemble the necessary tools (and cash) required to cross the border, which was to open for a mere 30 minutes. As the organisers had agreed to pay a bounty on every bag of rubbish removed from the area, â€œscavengersâ€ were also observed to be hard at work. The levels of bribery and corruption increased as the time drew near, and the Venturers were observed to be staking out several likely approaches to the finish line. When the border finally opened the race was on to be the first across the line! Some Patrols were able to cross without a problem, whilst others had to resort to tremendous bribes to get across. Only a small handful failed to escape. When the dust settled, the points tallied, and the last ticks removed, it became apparent just how close the Scout competition was (26 Points separating the Patrols in 1stÂ and 2ndÂ place) and just how much rubbish had been removed from the site (see picture)! The Venturer competition turned out to be another photo-finish: Squads from Merimbula and Gundaroo Venturers had been duelling for top rank most of the weekend, with several other units hot on their heels. Prizes were Snowgum vouchers purchased for the event, plus some tents and sleeping bags generously donated by Snowgum in their continued support of the WWG. Special note should go to ALL the Venturers who attended. With attendance from Illaroo, Gundaroo, Korrahill, Warilla, Thirroul,Â BlackÂ RangeÂ , Bomaderry and Merimbula, we were very pleasantly surprised by the strength of the Venturer response, and were even more pleased with their performance during the event. Without a doubt the event would not have succeeded without their support. The Leader and Rover contribution was also awesome, and their willingness to participate once again made the WWG event a great example of the Scout sections working together â€“ and having fun in the process. Well done all! We hope to see all the competitors return to Cataract for WWG IX in October!